Firefighters worked through the night to tackle a fire on a boat at Kip Marina. The Scottish Fire and Rescue Services (SFRS) were called out to the Inverclyde marina at around 1:45am on Sunday morning after receiving reports that number of boats were on fire. 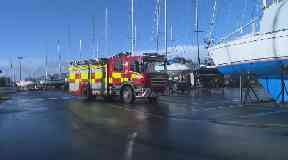 Five crews were sent to the Yacht Harbour in Greenock. The firefighters spent 11 hours at the scene dealing with a fire on a single boat with the operation finishing on Sunday morning. Graeme Binning, SFRS local senior officer, said: "This has undoubtedly been a technically challenging and protracted incident, and our crews have worked throughout this morning to ensure the area is made safe. "The nature of the incident required careful planning as we worked to prevent further damage to property." He added: "I would like to take this opportunity to thank our firefighters, Operations Control and our partners for their hard work and support throughout this incident."